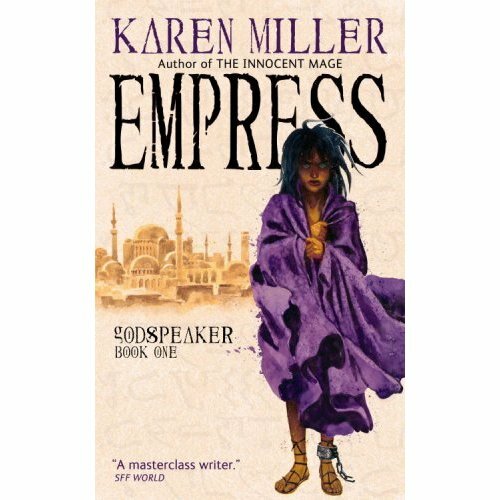 Empress (Godspeaker Trilogy Book 1) Karen Miller, Published April 2008. Karen Miller is a great storyteller. If you liked her previous series Kingmaker, Kingbreaker, you’ll enjoy this new series. Fast-paced and easy to get into, I sped through Empress and am keenly awaiting the next book: The Riven Kingdom. Empress is the first in line to a new trilogy outing by Miller, Godspeaker. Mijak is turning into a desert, some of its provinces are failing, some are still green and fertile. Its citizens are fanatical about their Gods and making war. Mijak is a ruthless place run by Warlords and priests who divine the Gods will through entrails, blood, sacrifice and scorpions. In the barren wastes, Hekat is sold into slavery but from the start knows that she is precious and destined for something great. Empress tells her merciless rise to power. Mijak has a great ancient Egyptian feel, you can almost imagine Hekat as a power hungry and insane Cleopatra. Add to this a bit of puzzling magic and magical items (never fully explained), great “knife-dancing” and the battle, sacrifice and other violent scenes are gory and detailed. The plot holds no quarter, just when you think things can’t get any worse they do. Check out the contentious reviews over at Amazon, over the book and Hekat in particular. Granted Hekat is not the most heroic or virtuous of characters but she cannot be ignored – I hated her for most of the book. Nevertheless she stands alone in her own right and I found her quite refreshing (plus there are lots of other nice characters to identify with). Read an extract and decide for yourself. I also found this interesting cover over at fantastic fiction, I think the UK cover is much better visually and the cheesy tagline doesn’t do much for the cover (Her name is Hekat and she will be slave to no man).